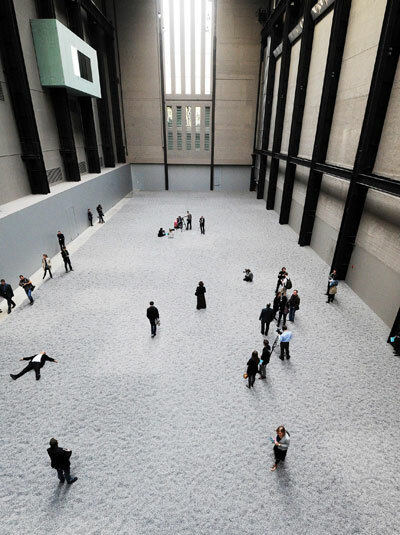 Monday 11th October 2010Tate Modern Taken Over by.....Sunflower Seeds? The work, which is titled "Sunflower Seeds" is actually made up of millions of small works of art; each of these little sunflower seeds are actually life-sized replicas of sunflower seeds made out of porcelain. Each seed on the floor of the Tate has been hand-crafted and painted in workshops in China and represent the hard work of hundreds of skilled craftsmen and women. Al Weiwei is a famed conceptual artist and a larger than life social commentator who was involved in the design of the "Birds Nest" stadium for the 2008 Beijing Olympics, even so, the artist is said to have a strained relationship with the Chinese authorities. Weiwei's "Sunflower Seeds" are rumoured to be representative of the artists generous and given nature but also linked to our views of what it means for something to have been mass produced in China. The connotations that this particular concept has in Western society and the way that we perhaps take the availability of mass produced goods for granted are captured in this artwork that allows the viewer to walk over the tiny porcelain productions. Certainly an installation for all of the senses, Weiwei's work will remain in the Turbine Hall until May 2011. As the 11th artist to be invited to make an installation in the Turbine Hall under the Unilever Series at the Tate, Weiwei has some tough acts to follow, with the former power station having played home to works by Doris Salcedo, Louise Bourgeois and Olafur Elliason. View the Tate Moden website for more visitor information.